Since this is the holiday season, the thing to get wrestlers is of course wrestling stuff. Be it wrestling movies/DVDs, books, gear or anything else wrestling related, it is usually under the tree on Christmas morning, at least in my house. This year my loving husband, “Impressive” Anthony Wayne somehow found out on of his presents would be the Jake “the Snake” Roberts DVD. Well some of my friends had told me about it, so I thought why not, he has just about every other one, why not one more. Boy was this one different from a lot of the other ones I have seen. Like Lipstick & Dynamite that I received on my anniversary (don’t ask! ), this DVD delves into the side of wrestling that some rarely see. 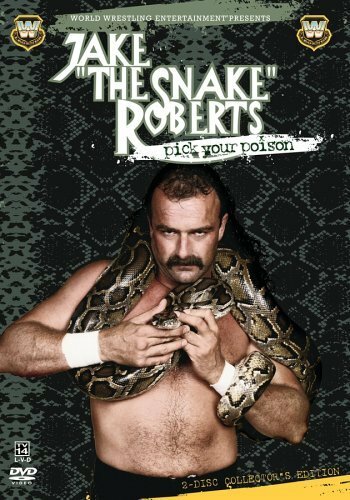 This DVD definitely shows some of my favorite Jake “The Snake” Roberts matches, but it shows how much Roberts can bring just about anyone into his world with the soft-spoken words that flow from one of the greatest psychology men in the wrestling business period. The matches range from one of his first runs through the southern part of United States and then throughout his tours from North Carolina to Canada then to the WWE. His run in the WWE, then WWF, was one of the most memorable for the generation of yesterday which includes Randy “Macho Man” Savage and of course Hulk Hogan. But the stories that he told of, including some of the story possibilities did not floor me, but it did intrigue me. Over the course of his tenure, the possibility of taking on Hogan, which a lot of people would have loved to seen, is described as an all-in-all ax job; especially the way he tells it. But that is just one story. The dark side of Roberts was also brought into the spotlight. The drugs, the alcohol, the pain and the heartache of the wrestling business are also brought forth. What a lot of the professionals that travel the roads of the world every day may not come close to what Roberts had to happen, but it is a good warning to what could happen. With the deaths of Eddie Guerrero and many other wrestlers that have went past us, the details of their earlier lives that not mirrored, but wanted to parallel Jake’s life puts into perspective what is important, life. Now that Jake has not only come clean with his addictions and his demons that have invaded not only his closet, but his entire life, that step was in the right direction to the future of the wrestling business. I know that this may not be one of my more powerful articles that each of you are used to reading, when I get about 45 minutes between school and work, but this DVD is definitely one that I do recommend for any wrestling fan or any person, be them male or female, that has a passion and a love for the wrestling business, please at least pick this up and see what I mean.